FEATURES/SPECS This vintage style personalized man cave sign has a billiards theme against a weathered wood backdrop. Front and center is a racked set of pool balls. 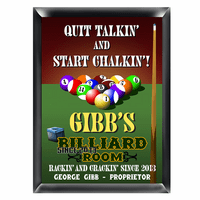 Above that, you can add the recipients last name and they'll be listed as the owner of this pool hall. 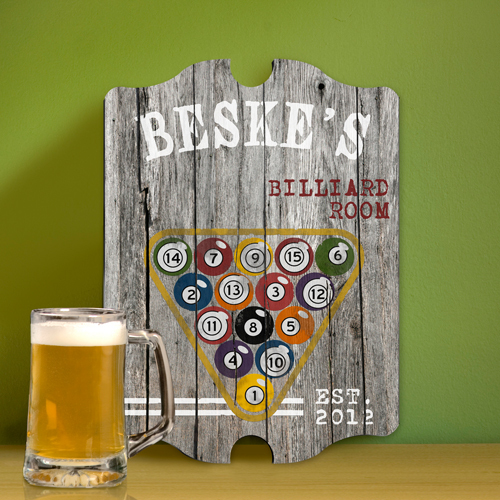 Top off the personalization with a date of establishment, perfect for christening a new man cave. 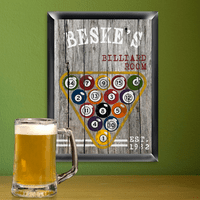 This unique man cave sign comes ready to hang and ships out within 3 day of ordering. 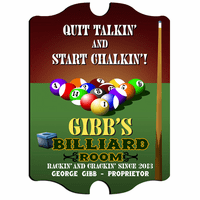 Dimensions: 10 3/4" x 15 1/2" x 1/4"
I was very pleased with this product. Delivery was fast. I talked to customer service because of a mistake I made, they fixed the mistake immediately. Great product, great service, fast delivery, a triple play. I would have given them 10 stars. and be the first to know about exclusive limited time deals. 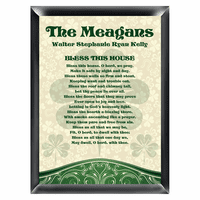 © COPYRIGHT 2019 Executive Gift Shoppe. All Rights Reserved. Terms & Conditions.